The Pale Morning Duns are prevalent on most western US rivers from July into September. 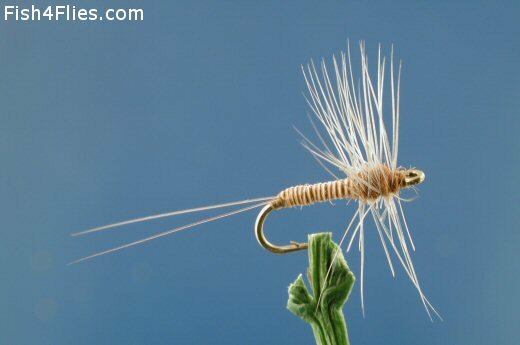 I normally fish the Henry's Fork in early August, and at that time one can count on a PMD spinner fall beginning midmorning on most days, followed by or concurrent with an emergence of duns lasting well into the afternoon. The emerger and the spinner have proven to be the two most consistently effective design of flies in this area. The rationale for tying variations using the alternative materials, may best be explained by a story. On the last day of my most recent trip to the Henry's Fork, I began casting to a large, rising fish at about 1:15 PM. I cast to the fish for three-and-a-half hours, trying some 20 different flies, primarily PMD imitations but also imitations of some other insects that were in evidence. During the entire 210-minute episode, the fish did not stop its slow, deliberate surface feeding for longer than perhaps a minute or two. The fish, which turned out to be a 21.5" rainbow, finally took the fifth emerger pattern I cast to it. This pattern was only slightly different to the others I had been using. The "winning" design was the Zelon-winged emerger. Early in our meeting, the fish had "bulged" to the transitional emerger with a CDC wing. The Zelon-winged transitional, the CDC-winged emerger, the PMD nymph, as well as the floating pheasant tail nymph (normally very effective) had all been ignored. An organism with a brain the size of a #4 shotgun pellet had stated a strong case for the angler not to become wedded to a single design! Hook : Size 18 and 20. Tail : Tied split, a single dun microfibbet on each side. Abdomen : Stripped brown hackle quill. Thorax : Rusty brown dubbing. Wing : Pale dun hackle, palmered over thorax and clipped flush with thorax on bottom (shown). Lightly marked grizzly hackle may also be used. No special or complex techniques are used in tying this design. Where I have suggested substitute or alternative materials, it is because when preparing for a trip I generally tie some flies using each material. If, for example, a fly tied with a Zelon wing doesn't work, I'll try one tied with the alternative material. Where I have suggested CDC as an alternative for Zelon, I personally prefer fishing flies tied with Zelon because of its relatively greater durability. Of course, in appropriate sizes and colours, these designs may be used to imitate any Mayfly. TMC 101. Currently there are no comments about the Pale Morning Dun Spinner fly pattern from other fly fishermen yet.